The Bombala River in South East NSW starts below Brown Mountain at an elevation of 1170m and ends at an elevation of 635m merging with the Delegate River. 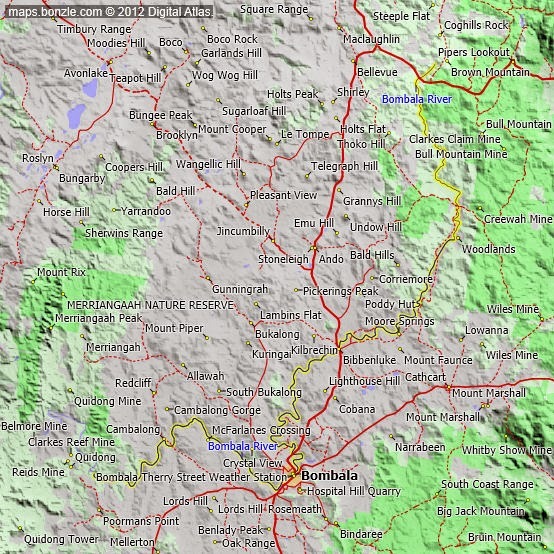 The Bombala River drops around 535m over its 87.4 km length. Ah the elusive, secretive and rarely seen platypus. They live along the banks of rivers and streams. They spend a lot of time in the water, up to 14 hours per day feeding. * They have a thick coat of slightly oily fur, one coarser outside hair with finer thicker under hair, which keeps them warm if the water is really cold. * Their strong webbed front feet pull them through the water when they are swimming. Their tails are used for steering. They generally don't change direction underwater. * The bill is soft and rubbery and has 2 holes that are their nostrils near the end. The bill is very sensitive and is used to find their food on the bottom of the river. * The platypus likes to eat worms, shrimps and small crayfish. * They must come up to the surface to breathe. They drown if they get caught in underwater fishing nets or crayfish traps. * They live in shallow holes in the banks of the river during most of the year. * When the female is going to lay her eggs, she digs a long winding burrow in the bank. The entrance to the burrow is small so the mother has to squeeze through and this acts as a scrapper to remove all the excess water from her fur before reaching the platypups. * Females lay up to 3 eggs. When they hatch, the babies lick milk from the fur on their mother's stomach. * Six months later they'll have learnt to look after themselves and they'll have to find their own quiet bit of riverbed. this is a stock photo not one i have taken.